Kid's Games - Lost in time. The conversation began as we drove through the kind of neighborhood where we grew up. "Where are all the kids?" Long before the era of play dates, or TV we grew up in neighborhoods, where kids played outside... summer, winter, and almost all day long until the streetlights went on at night. Bikes, trikes, scooters, wagons, soap box racers (term used loosely), roller skates, stilts, and for the "better off kids", pedal cars. Organized games just didn't exist. It was pick up football, baseball (with our own rules), stickball, capture the flag, and Red Rover. 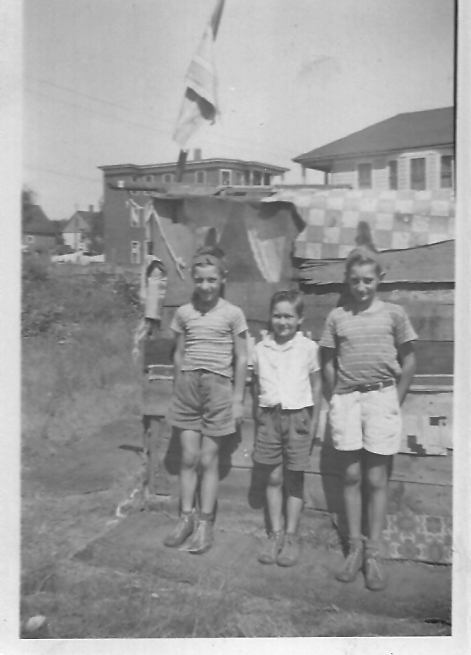 We built igloos and snow forts in winter, dugouts and underground tunnels in summer, and "shacks", that we built out of junk wood and linoleum, in the vacant lot next door. (see picture) 1944. But the real history test comes here, a short list of the 1930's, 1940's games that every kid knew and played. Some survived, others, maybe not. TAG - Stoop tag, flashlight tag, blindman's tag, backwards tag, alphabet tag, ICU tag, hop tag. Playing cards - Baseball, plane recognition cards, movie star cards... and we played... scaling the cards against the wall... 1/3 covered, tipsies. The cards came from Fleer's double bubble gum when we could get it (rationing, ya know). Pitch pennies... Not until later... Who had pennies? Dodge ball... big kids played with a softball.. yeah! Stretch- Played with knives, and never when adults were around. Jump Rope.. Double rope... in our area, boys, too. Throwing Fingers - We learned this from our dads, who played it in the mill for nickels. "Chicken" ... which could take ANY form. How many fingers do I have up? Different from throwing fingers. "Begins with..." dogs, cars, toys, states etc. me on the left... we must have been indians that day. We used to throw our pocket knives into the ground as close to our opponents foot as possible. If you moved your foot you lost. Did this on the playground at elementary school. Had a teacher come up once and comment that we were going to get hurt, then left. She did not stop us. Imagine that today with all the safety protocols around children! You would be a terrorist if you took a little pocket knife to school now. Whiffle ball and two square were popular in my neighborhood. Plus lots of tree related activities - climbing trees, tree forts, rope swings, etc. We also loved to explore the woods and creeks in our area. And yes, we all had bikes and clipped playing cards to the spokes. Throwing pocket knives at feet and being allowed too? Was you writing on stone tablets back then, too? I have to admit, I miss a little bit of the days of "if your dumb enough to do it, then you have to deal with the consequences". I remember having the big metal monkey bars to climb on with concrete all around it. Blood was always on the bars and concrete as we were always busting our melons somehow with the crazy stunts on them. BYW, I guess concrete was later found out to not to be an effective agent in cushioning a fall as I don't see it used anymore. We used to climb up the metal poles that supported the large metal slide on the playground. On girl tried it and broke her arm when she fell onto the asphalt below. Slide was still there for many years. Oh yeah, in the Summer the metal on the slide heated up enough to burn you. The swings originally had a wooden board for a seat. Later they replaced them with the safety seats you see now. We used to make "guns" out of cardboard and paper and spend recess shooting at each other. Now they would call the police if you drew a gun. Yeah!... That's the game we called stretch... except, you threw the knife into the ground as close to your own foot as possible... then moved that foot up to the knife. Took Turns... Each time you tried to move your foot to keep it close to your body... Eventually, as each throw moved your legs farther apart, you were s-t-r-e-t-c-h-e-d out until you fell, and lost. Our playground was concrete, too, and past the concrete pad, cinders that came from the coal furnace that heated the school. Don't really remember anyone getting hurt, except for Harold Dawson, who got caught under the merry go round... (just a broken wrist and bruises). Any takers on the "Hits and Cracks" game? When I was in grade school almost every boy had a pocket knife and mumbly-peg was a regular playground game. Bringing cap guns to school was not unusual; but, here in ND, most boys had at least a BB gun by the time they started school. -- Play kick the can nearly every afternoon in the street. Great fun. -- Go for all-day bike excursions to neighboring towns, often used the flood control channels as trails. -- Played Frisbee tag on bikes in the street. Two people about 100 feet apart were "it", attempted to hit a bike rider with a Frisbee--the tagee became "it" and the thrower got on his bike to join the fray. Schwinn Stingray bikes or Huffy/no-name similar bikes were the most popular mount. -- Sleepovers at a friend's house with all-night Monopoly games. -- Sliding down the hill on cardboard. The foxtail weeds smashed down to a slippery mat. Best in Spring or fall. Kids (8-13 YO) stayed out all day and parents never knew exactly where we were. Somehow everyone survived. We also used to play the game where we threw a knife close to our own foot. A little different... maybe a little more risky. In those days... early 1940's, the streets were not kept as squeaky clean as today. Perhaps once a year, a sweeper would come down, and sweep the gutters... We all had sidewalks and curbs, due to the WPA. People weren't as fastidious as today, either, and it was common to toss things into the gutter... Cigarette butts, candy wrappers, etc, and there tended to be a build up of goopy silt. Anyway... back in those days, cigarette packages consisted of a tinfoil wrapped inner package, the outside label package, and the cellophane package cover. To help in the war effort, we kids, would pick up the packages, strip off the tin foil, and roll it into a big ball, to later be brought down to the metal recycle man... for a $1 or so in cash. Was lead, size of a softball. The most common cigarettes were Lucky Strike and Camels. Now the inside wrapper of each Lucky Strike package, had some kind of a manufacture's code on the bottom, either an "H" or "K" each with a number alongside, from 1 to 20. Here's how the game was played.... Two people... When we found a Lucky's' package, the player would call H or C... and when we opened the package to the code, whoever won, would be allowed to "give" the other person, the number of hits or cracks listed next to the letter. A hit was given by forming a fist with the center finger knuckle extended.... and hitting the back of the other person's outheld hand... where the soft skin is. Ten hits, was enough to draw blood. Cracks were a little easier... a back of the hand (fingers) slap to the open palm of the loser. It was a mark of honor among the kids, to show the scab, or torn skin on the back of the hand, which meant you were tough enough to play "Hits and Cracks". BTW... catching impetigo, was a common occurrence. It annoyed me that, as a girl, I did not get to carry a pocket knife, cap gun, etc. I didn't like the dolls which were always being thrust at me. I hated baby dolls (even though I did want my own real kids some day). In the meantime, I didn't see the point of a toy that went "waaaah" and wet its diaper. I wanted building-type toys, chemistry set, toy cars, toy guns, bow and arrows. I was stoutly assured these were only for boys! My mother compromised by getting me Tinker Toys, Lincoln Logs, and a little drafting set with a compass, pens, and a tilting table - apparently, these were gender-neutral. You rejected the girl sterotypes! Good for you A! I also didn't like dolls and never did the "Barbie" doll thing. Should come as no surprise to most round here I loved my plush animals. Had a room full of 'em. My doll Ruthie was my best friend when I was 11. I wasn't a girly girl but oh I loved that doll. We also played with home made paper dolls, and built forts in the woods. I also can remember lots of jump rope songs from St. Margaret's playground, but could never master double dutch. Maybe the boys were throwing knives around while we were turning jumpropes. Me too , every year I would put a chemistry set on my Christmas list . I never got one they were only for boys as well as those cool erector sets . I did have cap guns but only around the fourth of July. I LOVED stuffed animals and anything that looked like an animal (china figurines, animal-shaped gewgaws, etc.) Didn't have a roomful, but I had several which I still remember fondly, including a white cat made of (presumably) rabbit fur, and a stuffed cat which my Mother made out of pink corduroy. I still have that one, much the worse for wear and age. I don't mean to imply that I was the least bit a tomboy. I loved to play dress-up, pick flowers, and spray myself with every perfume I could get my little paws on. I wanted to grow up, get married, and have a baby. It was just manifestly obvious to me that boys got all the cool playthings with wheels or which made noise or sparks, while girls got toys which basically just sat there and had to be taken care of. That wasn't my style, and still isn't. Funny, I frequent a hunting forum and it is amazing how early the guys who grew up in the 40s through the 60s were allowed to basically be on their own with a gun. One even told a story of frequently being allowed to walk home from downtown with a .22 and coming home with dinner before sundown. As a kid, I was under the thumb during the school year but pretty much free in the summer. We spent summers in a second home in a ex-urb/semi-rural area and I was pretty much gone all day until dinner time. Most of the time I was fishing in one of the lakes or at a rec program the town ran (staffed with bored college kids and you came and went as you pleased), but really my parents had no idea where I was or what I was doing. Yes, I usually had a pocket knife (rusty sheath knife if I was fishing). Growing up in a town of 1500 people everyone knew everyone else so while kids were somewhat on their own the parents always heard about it if we did anything we shouldn't be doing. A town this small had no rec programs, we had to entertain ourselves. I spent one day teaching myself to ride a bike by going to the top of a hill, getting on the bike and pushing off downhill. I was a little beat up and bruised by the end of the day but I could ride the bike.